Duck duck goose! As I sit with a friend practicing bird flight shooting techniques on Goose pond, this old familiar child’s game comes into memory from years long ago. The pond is full of ducks and geese today. The sky is a brilliant blue with some high white cirrus streaks. The Canada Geese honk their approach. They come in flights like a squadrons of fighter jets in formation. As they circle the pond, they turn and glide into a graceful approach. The landings however are only as graceful as a fat goose can get. And then we get a surprise visitor. As we look into the sky at some circling vultures another large dark winged bird appears among them. 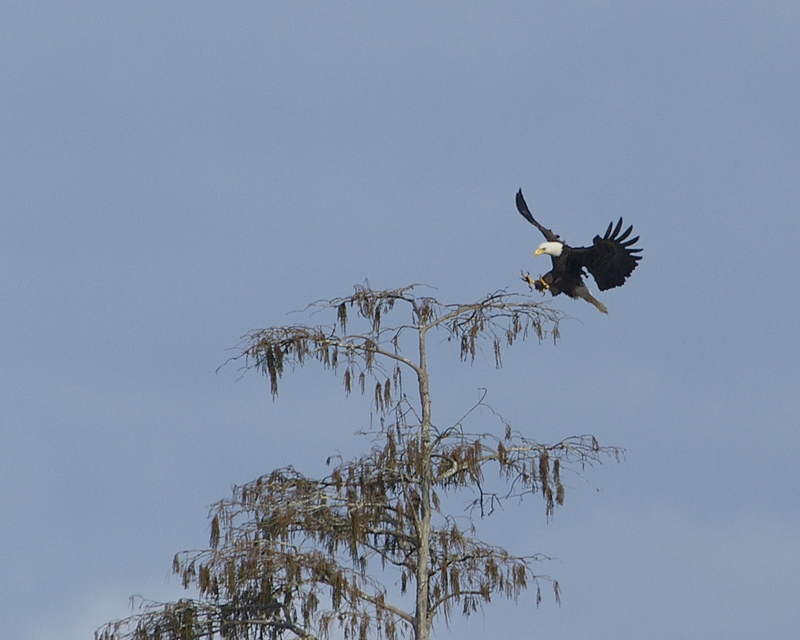 A majestic Bald Eagle glides high over the pond. The eagle is definitely interested in something, most likely a duck. It goes into a landing glide to perch in a tall pine across the road. As the eagle’s claws reach out to grasp the limb the blackbirds sound the alarm and begin to dive bomb the intrusive raptor to get it to leave. No duck for this eagle today. It is definitely the start of duck season on the Broward also. I spot the Hooded Mergansers this week for the first time since last winter. Time to get out the blind and see if we can get some close encounters of the hoodie kind. The Editors favorite, the Pie Billed Grebe, is also making more frequent trips into our small lagoon. The Snowy Egrets and other herons looking for opportune fish that the Grebe scatters while swimming underwater often trail these diving birds. Blue and Green Wing Teal and other ducks are also being seen in the local ponds and rivers. They launch like a rocket when they take flight. Duck duck goose, tag, you’re it! GOOSE!, tag, you're it! Canada Goose fly by. A Majestic Bald Eagle soars over the pond. Hmmm, those duck look delicious..
Maybe I will just drop in for a while. Geesh, you don't have to go away mad,,,just go away! Blackbirds pester the Eagle.. Ducks on the river. Green Wing Teal (two on the left) and Blue Wing Teal (on the right). Green Wing Teal blast off! See ya next week...coffee time!